THE BRAVEST is a riveting and emotionally-charged look at the men and women who work in the most dangerous profession in the world, firefighting. Featuring real stories and real heroes, this live-action reality series transport viewers to scenes of raging fires, car wrecks and life threatening rescues…and then back to the firehouse where firefighters live, eat and sleep. Filming with the busiest fire departments across North America, THE BRAVEST profiles these courageous individuals who run into burning buildings while everyone else is running out. POPULAR MECHANICS FOR KIDS takes young viewers on a magic carpet ride to some of the world’s most exciting places where they get a first-hand look and feel of what it takes to build and operate everything they see.Whether it’s blasting off to a new planet or journeying to the center of the earth, POPULAR MECHANICS FOR KIDS satisfies curious minds with valuable experiences that will be a bridge to new and exciting worlds, and a place where kids have fun learning how things work. FAMOUS HOMES & HIDEAWAYS, hosted by journalist and actress, Donna Hanover, is an exciting series which explores the most lavish homes and vacation spots of today’s celebrities. From beautiful to romantic to the utterly eccentric, you will be amazed by the luxurious lifestyles of Hollywood’s favorite stars. Thirteen-year old Marshall Teller, the hero of EERIE, INDIANA, is a modern-day Tom Sawyer in search of adventure. Eerie, his new home town, may seem like the nation’s most idyllic suburb, but as Marshall soon surmises, it is actually the center of weirdness for the entire planet. Spinoff of the series "Eerie, Indiana," about the strange adventures of two boys, Marshall Teller and Simon Holmes, in their seemingly normal home town. The new stories begin when 13-year-old Mitchell Taylor and his 11-year-old sidekick Stanley Hope notice some weird things going on around town. When they encounter Marshall and Simon, Mitchell and Stanley learn that the strangeness from Marshall and Simon's dimension of Eerie is beginning to invade their own "world." THE HIDDEN SECRETS OF MAGIC is a one hour special that tells the story and secrets of the magical feats that have gained legendary status worldwide. Houdini’s greatest death-defying escapes and wondrous magic illusions are re-created by today’s greatest magicians in this one-hour television event special. Lance Burton was the first American illusionist to win the coveted World Championship of Magic. He is now the star of his own show at the Lance Burton Theatre in Las Vegas… A great honor having a theatre built especially for him and designed to his personal specifications! Lance Burton is consistently voted the World’s “Best Magician” and “Best Entertainer” and now, this handsome young magician will astound viewers with his totally original and captivating approach to the art of grand illusion! The world champion magician Lance Burton brings us out to the Nevada desert for the most ambitious and outrageous illusion yet: producing a full scale flying saucer out of thin air-and then hitching a ride back to his Lance Burton Theater in Las Vegas! Prepare to be amazed! Nothing short of a world event, this two hour special was the first primetime showcase for magical talent in three decades. THE SECOND ANNUAL WORLD’S GREATEST MAGIC searched around the globe for more of the greatest magicians, illusionists, close-up workers, comedy magicians and mind readers today, and brought them all together at Caesars Palace. The world’s greatest magicians gather together again and create a magic show that will amaze and excite all audiences. In one night, 18 magicians from around the world will perform their all time best. Join the fourth annual celebration of magic, mystery and grand illusion as twenty of the most talented magicians gather at Caesars Palace in Las Vegas to perform the hottest acts from around the world. The WORLD’S GREATEST MAGIC returns for a fifth time. This special features an impossible mega-illusion where Baywatch star Kelly Packard gets beamed across the Grand Canyon – without any camera tricks! Plus by simply touching their television screens, the home audience will participate in an interactive illusion where they will unmask the masked magician, and expose the exposer! In this close-knit community, honest, caring people find the strength to persevere…and triumph. Their stories, dramatized with warmth and humor, speak a universal truth. Welcome to BREWSTER PLACE, a half hour TV series of heartwarming entertainment, based on the critically acclaimed miniseries. For more than 60 years, loyal fans explored the galaxy with Flash Gordon, the original space hero based on Alex Raymond’s classic comic strip. Watch the characters, including Flash’s companions Dale Arden and Dr. Zarkov, that inspired modern-day classics such as “Star Wars” soar to new heights in these live-action serials. BLONDIE! The name of the lovable madcap housewife is known around the world. One of the world’s leading comic strips, BLONDIE appears in more than 2000 newspapers daily and in 55 countries weekly. This popular comic strips of the hilarious scenarios of life is brought to the screen. Presenting history’s greatest conflicts from hot issues to cold wars. Each hour will go behind the headlines and offer a fascinating look into the circumstances, the people and the intimate situations that mixed together and exploded into a tumultuous rivalry. Famous rivals include Churchill vs. Hitler, John F. Kennedy vs. Kruschev and Mansfield vs. Monroe among others. PERSPECTIVE ON GREATNESS is a program about people. Special people whose real life stories are more fascinating than fiction. These are the people whose names strike a chord with people throughout the world – whose personalities and charisma earned the respect and admiration of everyone around them: F.D.R., General Douglas MacArthur, Mahatma Gandhi, Helen Keller, Thomas Edison, and Charles Lindburgh to name a few. TIME CAPSULES is a trip into the past, offering glimpses of the people, places and events that shaped the twentieth century. Events that span the world of historic news, show business, politics, science and sports. Documentary on the life of Hollywood actress Grace Kelly, who later became the wife of Prince Ranier of Monaco. Profile of actresses Debbie Reynolds and daughter Carrie Fisher in which they discuss their professional and private lives. Documentary on the life and career of TV host, singer and actress Kathie Lee Gifford. The life and work of the controversial---and often enigmatic---artist Yoko Ono, widow of ex-Beatle John Lennon. "We've known them as fairy-tale princesses and tabloid-magazine covers," says narrator Lee Grant of the princesses of Monaco---Grace, Caroline and Stephanie. The torch has been passed to a new generation of Kennedy women -- an intimate portrait of Caroline Kennedy (best-selling author), Maria Shriver Schwarzenegger (First Lady of California and former network news anchor), Kathleen Kennedy Townsend (Lieutenant Governor of Maryland) and Kerry Kennedy Cuomo (international human rights worker). Exciting, mysterious, passionate, dangerous – love has many sides. IN THE NAME OF LOVE explores love and the unforgettable, true experiences of celebrated couples and everyday people whose lives were forever changed by it. A one hour pop cultural special which salutes American ingenuity by taking a look behind-the-scenes at uniquely American products and places. A special featuring the reenactment of four unexplainable, fortuitous events. Violence is no stranger to the shadowy docks of the Hamburg harbor. But when the son of an international mob boss is killed by a customs officer, the shockwaves are felt around the world. WHAT HAPPENED? examines man-made disasters, plane crashes, bombings, bridge failure, train wrecks, among others and recreates their underlying causes and what happened. Using the vast resources of the Smithsonian Institution, famed worldwide for its matchless research and museum facilities, the SMITHSONIAN EXPEDITION SPECIALS set off in search of the remote places and people of our planet. Each unique, one hour documentary, in the still thriving tradition of scientific expedition, gives viewers the rare chance to experience these amazing discoveries first-hard. 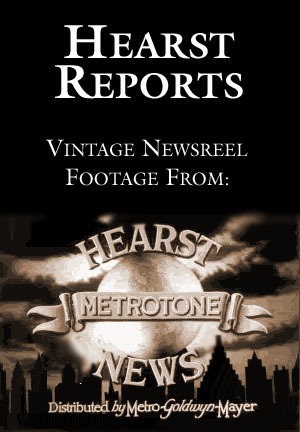 Hearst Metrotone Newsreel footage featuring headlines of the people, places and events that shaped the twentieth century. A one hour documentary special coinciding with the 1996 Summer Olympics, POLITICS & THE GAMES recounts the heroic struggle of athletes competing on the international stage, even as that stage is consumed by political conflict, social injustice and even terrorism. While almost everybody dreams about becoming a successful Hollywood celebrity, what do the celebrities themselves dream of doing? In the exciting one hour special “FANTASIES OF THE STARS”, television celebrities live out their wildest fantasies for the world to see – no matter how bizarre or unusual.